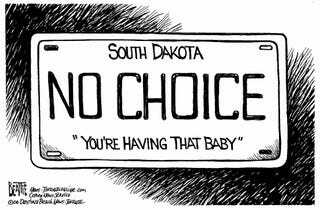 South Dakota may have dropped the bid to enable the murderers of abortion doctor, but its House and Senate have both passed a bill requiring a 72-hour wait for an abortion, which would be the longest in the nation. Most outrageously, it would require women to visit a crisis pregnancy center before undergoing a procedure, also the first of its kind. So far, the anti-abortion governor has declined to say whether he'll sign the bill.